Good morning! I hope your week has been treating you well. And if it hasn’t…well…at least it’s almost Friday? I don’t have cable, so I don’t get the chance to watch a lot of TV/hear about a lot of new shows. But checking out Katie’s blog last week, she mentioned a new show I hadn’t heard about – The Taste. When I heard that Anthony Bourdain was on it, I knew I had to check it out – he is one of my favourite people ever. But as I watched the premiere, I found my attention and thoughts continuously going back to the lone female and the judge representing the home cook – Nigella Lawson. Back when I had access to the Food Network, I used to watch her show whenever I got the chance. And now, I’ve remembered why I’ve always had a slight girl-crush on her. Her attitude and her relationship with food is one of the most admirable things I’ve ever seen. Watching her describe food serves as one of the biggest reminders ever that food is meant to be enjoyed. Everything she makes looks homey and comforting, and you can tell that she truly enjoys everything that she puts together. Really, it reminded me that we tend to overthink our food. We tend to be so concerned over calories, over macros, over the guilt that we feel for eating something that we ‘shouldn’t’ that we completely lose the joy that dining is supposed to bring. Tell me, what’s more enjoyable – eating a delicious homemade chocolate cake, savouring every bite, or eating that same cake while you’re wondering what the calorie content is, or how much extra time you’ll need at the gym the next day to burn it off? Somehow, I think it’s an easy answer. Yes, once in a while, we’re forced to grab something out of the fridge and eat it in the car because we’re running late, but whenever I see Nigella describe her cooking or describe the flavours in the dish she’s eating, it reminds me that I need to make sure as many meals as possible are enjoyed to the fullest. Yes, food is necessary for survival, but I also think that GOOD food is necessary for sanity and for happiness. And really – look at that woman. If that isn’t an argument that eating butter, red meat and chocolate can be good for you, I don’t know what is. Woman is 53! While she’s obviously very blessed, genetically, she’s also a fabulous example of why you don’t need to be a size two or have flat abs. Yes, she is absolutely beautiful, but she also comes across as a very warm, comforting, intimate human being. So basically, what I’m saying here – food is meant to bring you health and energy, but it is also meant to bring you comfort, warmth and happiness. It is meant to draw people together and is a huge part of bonding experiences. So remember that next time you sit down to a meal – make sure it’s something you enjoy, and if you can, take the time to savour it. If it brought you happiness, never, ever regret it. 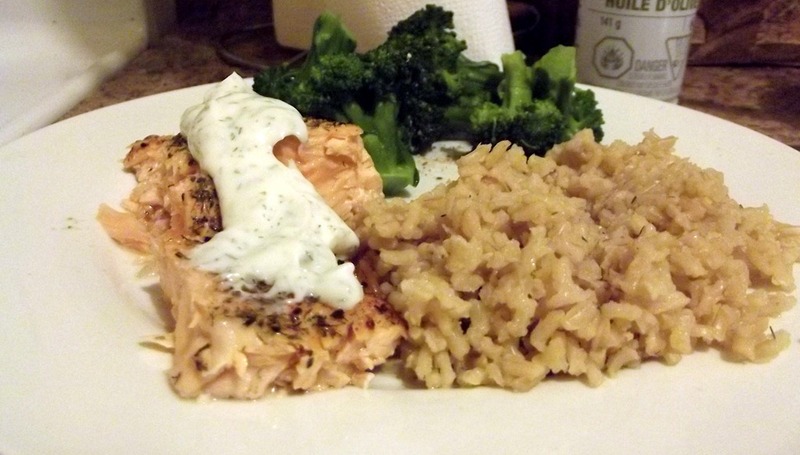 Salmon with a cilantro-dill sauce, brown rice, and steamed broccoli. All flavours that I loved and made sure to savour. I’m sure she would have been cool with the chocolate that followed, too. <— Is there anyone whose relationship with food you particularly admire? someone you know or a famous chef/food personality? 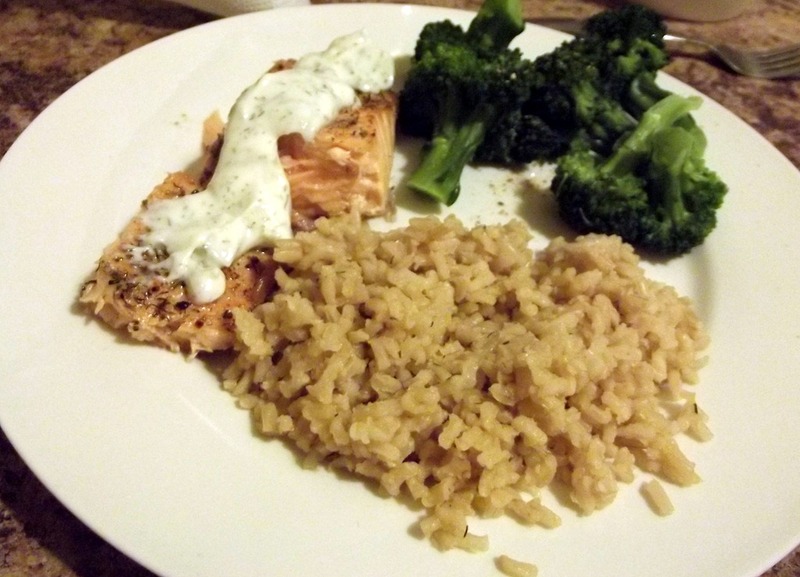 <— Do you ‘eat on the run’ a lot? It happens once in a while, but I do my best to avoid it. Categories: About Me, Dinner, Food Philosophies, Health, Inspiration, TV | Tags: chocolate, dinner, enjoy your food, food philosophies, Nigella Lawson, salmon, slow food, The Taste, why I love Nigella | Permalink.